In recent years, the human resource function in organizations has undergone many changes, from the recruitment processes to employee retention efforts and performance management systems. Most management teams have started to use technology for human resource acquisition and retention with chatbots, AI and machine learning making it easier for both the job applicant and employer to find the right match as cited by Jake Go, CEO and co-founder of pioneering recruitment firm Springboard Philippines. Recruitment’s screening process alone has significantly improved through technological advances such as automated systems that are starting to imitate Google’s way of tailor fitting ads using a person’s user data to learn that person’s interests and needs. Most also use systems that narrow job candidates by using specific keyword searches that allow HR managers to scan resumes in a matter of seconds. Some of these tools include Entelo and TalentBin, which both use artificial intelligence to search for and pick the best fit among the candidates online. Job portals like Jobstreet, Kalibrr, and Bestjobs now provide job seekers and companies a more convenient way of interacting through digital platforms. The advent of social media has also provided some companies a new way of screening their applicants and vice versa. According to a survey by CareerBuilder in 2017, 70% of employers screen their candidates through social media before anything else. As of 2017, LinkedIn already has 500 million users while Facebook has 2.2 billion users. With the Philippines being the world’s “social media capital of the world,” spending an average of 4 hours online according to a survey by Hootsuite this year, a company’s online presence and branding is important to attract the right applicants. Yet even though technology has been beneficial to the recruitment process, Jake Go says, “These online job platforms are useful in the recruitment process; Springboard adds value to them by incorporating the human component.” He and his business partner Tristan Ong, COO of Springboard Philippines believe that human connection should not be lost despite the digitization of recruitment but instead evolve with it. They believe that this is what makes Springboard successful as they provide value to the people and society. In their recruitment process, Springboard Philippines have Human Resource Executives who conduct psychometric exams to determine level of commitment, intelligence, and cognitive ability, along with their long term suitability for the job role. This recruitment process leads to a 30-50% employment hit rate, a number of loyal clients since their first year, and a fast applicant replacement turnaround rate. As a company, their mission is to bridge the gap between the employer and job seeker, to be the Launchpad for careers and growth in companies. Staying true to their value for human connection, they organized Wake Up Manila, a job convention with the purpose of strategically matching the right job candidates and companies. Happening this July 6-7 at the SMX Convention Center in Pasay City, Wake Up Manila will allow companies to “find the one” through engaging and fun interactions with job seekers to bring back that human connection amidst this digital world we live in. Companies who decide to join Wake Up Manila are encouraged to be more engaging with the applicants and in turn, Springboard promises to be more hands-on in terms of delivering the right people to Wake Up Manila exhibitors. “What we promise you are quality candidates that are going to come in. We guarantee you that around 70% of the candidates who will come in are going to be interested in getting a job,” Go shared. This comes from their insight that most candidates, especially in mall job fairs, simply come in to try their luck – they give out their resumes and leave. "Springboard will train and coach the candidates to provide the exhibitors quality attendees in the event," explained Jake. The company also wants exhibitors to see Wake Up Manila as an opportunity to market their brand and company, allowing them to get even better returns in terms of their hiring needs. “We promise that you will be able to build your dream team, to find the right people through us,” Go said. For companies in search of new employees, Springboard is inviting them to join this exciting job fair that gives them the chance to get closer to the people that will help their company grow even further. 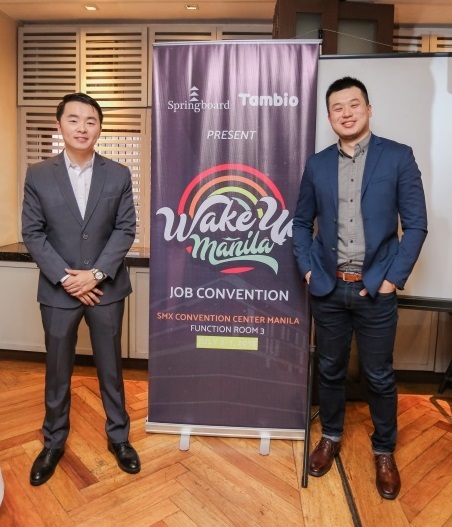 For inquiries about Wake Up Manila Job Convention, email jake@springboardph.com or tristan@springboardph.com.